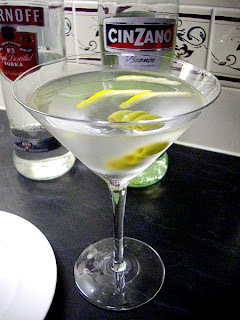 facebook and the tycho martini! If you haven't already seen, or if you just avoid social networks, there's now a Tycho Brahe Facebook page. This will be (for the foreseeable future) the principal means of sporadic band updates, in conjunction with the Tycho site right here of course, which will be used for more major announcements! Visit the Tycho facebook page now for updates on what's happening with Tycho right now, or at least, errrrm, just then. There's also a bunch of photos from our gigs with Psyche, the infamous "Schmoozing with Tycho" photo album is slowly being migrated there from Myspace, and you can access our online Music Store to preview (and/or buy) *almost* every and any Tycho recording ever released! 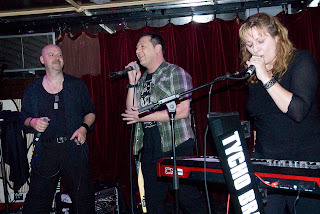 On very short notice we will be playing a show with our good mates Psyche this Saturday November 12th, in the Basement at iconic Melbourne venue, The Espy. Doors open 9:30pm, entry is FREE. 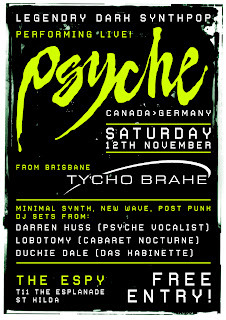 Our gig with Psyche here in Brisbane went off like the proverbial frog in a sock, so if you can get there, do NOT miss this show!